Today was the day when I transferred the pictures of June’s challenge to the computer. And it’s November now. Let’s just say that I will not be able to finish this year of HSM, because I’ve completely lost track of time. This blog will probably be in hibernation for a bit longer as well, but I’ll be back whenever I can. This also means that the Liebster Blog Award that I got nominated for has to be put on hold too (I don’t know how the time limits are on this one). I did get very happy about that nomination though, and the person who nominated me have done some of my favourite entries of all the HSF/M. So I really recommend that you check out Stella’s blog – she’s doing awesome stuff! So now onto the final blog post of my half-year of HSM: Out of your comfort zone and the Yogi Lace. My main source for this project was a Swedish web course in bobbin lace, which I found here. The lace I tried was the absolute beginner lace (udd och stad) from the Swedish Lace society, but I made it a bit larger than the original lace with help from an ordinary checkered paper (which also was used as my pattern). (This was really a budget style project, come to think of it!) I was helped by the videos on the course page to set up my bobbin work place. I can’t claim that the progress was as fast as I’ve seen it done by others with mad skills and proper tools, but all in all I was helped by the videos, and after a little while I got into the rythm of it. I think that to make a better lace, you’d probably need a better thread too, the flax thread I used wasn’t smooth. Close-up on progress. You can see it being slightly wonky. The finished lace was rather twisted when I took it from the mat, and I’m still not sure what to do with it, but I liked the whole bobbin lace technique and I might try my hand at this again in the future. Though perhaps with a more suitable workplace. My back hurt a bit after the bobbin sessions on the floor. Year: Not entirely certain which year this particular pattern comes from, but it’s rather simple, so it might also have been constructed rather late in the history of bobbin lace, as a beginners project. A lot of the preserved/extant lace dates to the 19th century, but there is an extant bobbin lace from the early 1500’s in today’s Sweden (but was then Denmark). According to one source I’ve found (also in Swedish), the technique of bobbin lace dates back to the Italian renaissance. Notions: Linen (flax) thread, bobbins, checkered paper, yoga mat, sticky tape, and pins. Hours to complete: I’ve forgotten. It was finished about 5 months ago. First worn: When I’ve figured out what to do with it. Perhaps it will be a bracelet of some sort. Total cost: The bobbins were a gift from my mum and the other things were in ”stash” (or at least in the house!) so I’ll count it as free. Sorry for all the hibernation lately, life got in the way of projects. I hope to soon post the story of the lace (which has been finished since June) and then we’ll take it from there. Moving approx. 1500 km, finishing one job and starting another in less than one week’s time is rather exhausting, but I hope I’ll soon be back on track again! But a quick summary of the ”Out of your comfort zone” challenge: Bobbin lace was a cool technique. 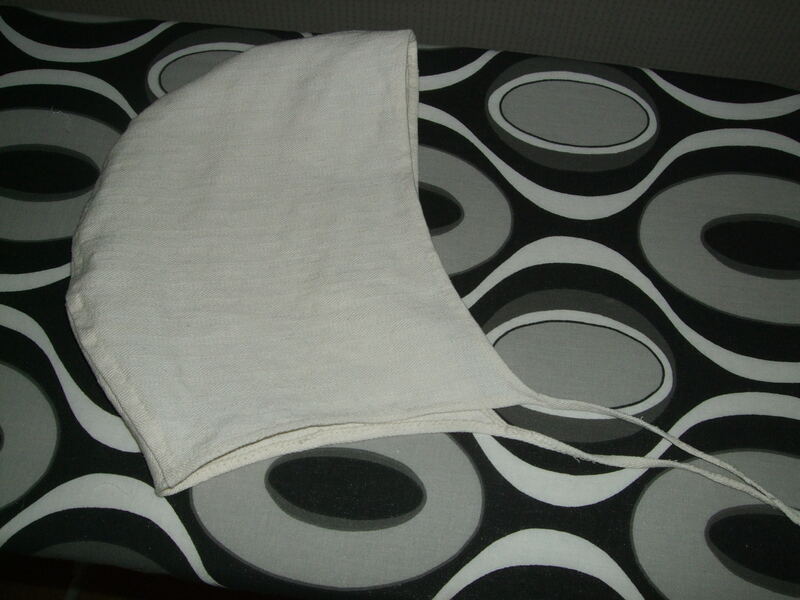 The yoga-mat-on-floor-as-bobbin-roll was a technique that did leave something to be desired. 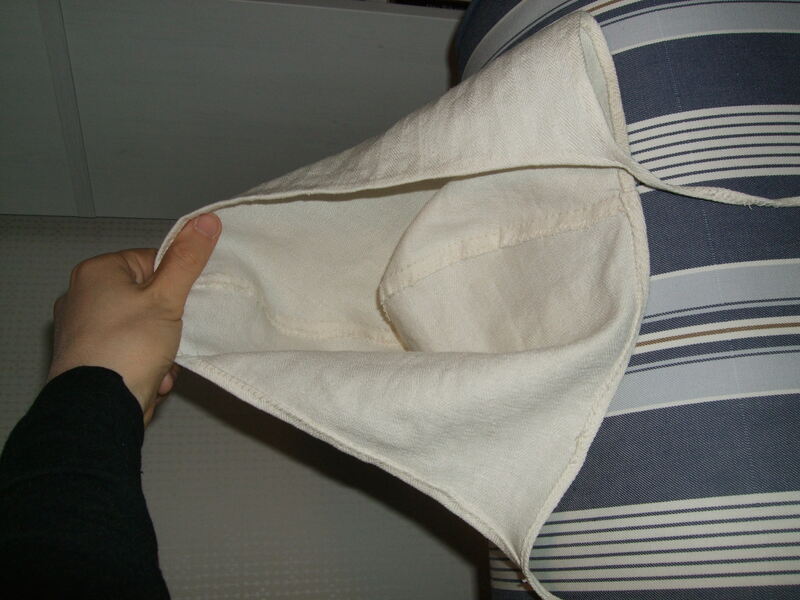 I think I’ll start looking for a proper bobbin roll/cushion – but not before moving! For the challenge of June in the HSM, Out of your comfort zone, I’m trying bobbin lace. It’s a technique that I find really cool, but being a non-lace-y person, I’ve never found an excuse to try it before now. 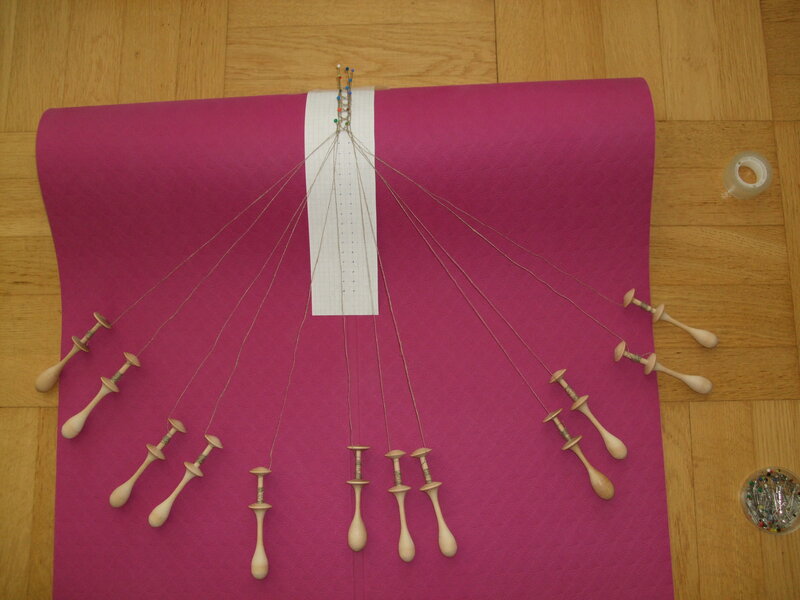 And as I haven’t got a proper bobbin lace roll (in Sweden there’s a roll, in the US – and UK? – I think it’s more common with a cushion, but I haven’t got a bobbin cushion either…), I have to make do with what I have. I have a yoga mat. It actually works. For the War & Peace challenge of the Historical Sew Monthly (link leads to The Dreamstress’ introduction), I chose to go quite simple, and make a coif out of leftover fabric. I’ve heard somewhere that the medieval man’s coif originated from a warrior fashion – the hat to keep the hair out of the chainmail hood – and then got to be everyman’s hat because the knights were cool. I haven’t been able to find a source for that though, so I can’t claim it as a fact. If anyone can say yay or nay to that theory, please let me know in the comments! Medieval manuscripts are however quite full of pictures of men wearing coifs, both warriors and peasants, as well as almost all other classes, quite often under other headwear. So that means that I could perhaps claim that both themes of War and Peace fits into this rather modest headwear – which to our modern eyes probably looks mostly like a baby cap. To find medieval images, I usually go to the Larsdatter links page, and here is a full page with links to men’s coifs. Images in the Maciejowski Bible depicts both knights and warriors and farmers wearing coifs. I recommend zooming these pictures, you’ll discover amongst other things soldiers dressing for battle in a hurry. Year: Medieval – from at least the 12th century onwards to the 16th, according to the images on Larsdatter’s page. Total cost: Leftover pieces from other projects, so not much, but difficult to say. The stashbusting challenge of The Historical Sew Monthly was for me a chance to sew a coat or a kaftan that has been waiting to be since 2008. 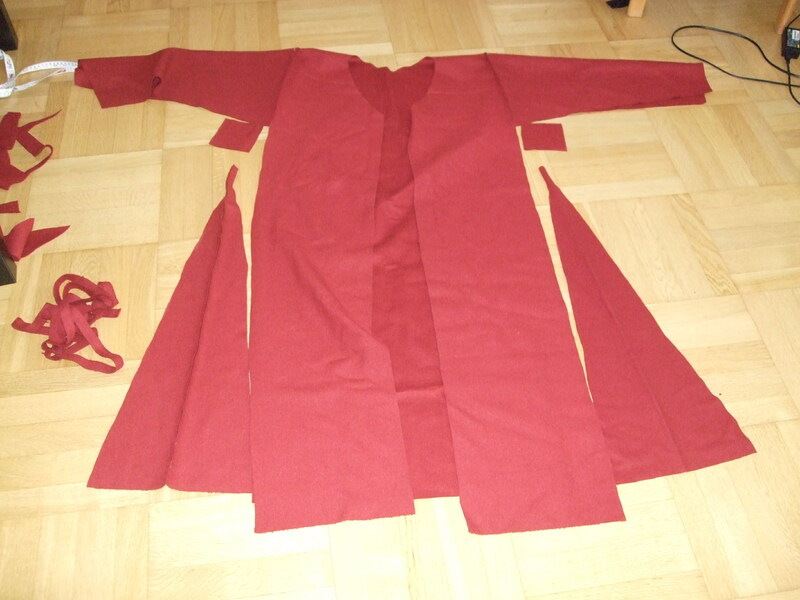 I actually bought the fabric with a different coat in mind, in the style of late 15th century, but that coat would require much more fabric, so a couple of years back, I changed the idea into a Viking style kaftan. 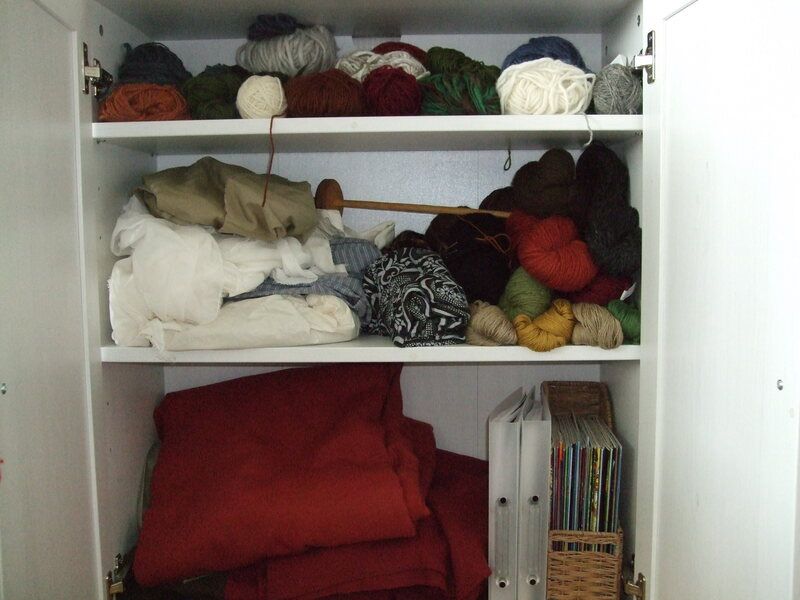 My stash and the beginning of the sewing process is described and depictured in this post. Whenever you tread onto the road of Viking garments, you realize that there is not much to go on in the area of primary sources. To be honest, I’d like to replace the term ”historically accurate” with the term ”historically plausible” when it comes to recreating Viking Age garments. I don’t deny that there’s a lot of knowledge even in the small pieces of disintegrating cloth that has been found. I’m an archaeologist, and small leftovers from the bountiful artefacts that once was is usually all we have to go on, and especially if you also know the craft that made the pieces you’re studying, you can tell loads from small pieces! But when those damaged, small pieces of cloth is reconstructed into whole outfits, with the help of how buttons, brooches and other ornaments are placed in excavated graves, and sometimes, if you’re in luck, with period depictions of humans/deities, then a lot of conjecture will naturally come into play. There is absolutely nothing wrong with this, since the alternatives are to either ignore the archaeology and other sources altogether, or not to re-enact at all and ignore the practical knowledge base from experiments and re-enactments. Neither of which is a scenario I’d like to see. I just think that in these circumstances, the words ”accurate” or ”correct” give a false impression of absolute truth, and can we please just call the same thing ”plausible” instead! Or to put it in other words, this rant is my personal pet peeve about the words we use, not the actual actions behind them, since everyone I’ve come across who has discussed the level of accuracy in historical re-enactments are perfectly aware of – and always state – the fact that 100% accuracy can never be obtained. So again, I campaign for the word plausible! Sorry about that little rant. Let me show you some pictures instead! So how does the whole thing look then? Well, it won’t be entirely ready until the Accessorize challenge in July, but here’s how it looks midway through. If you look closely at the hem, you can see that it’s rather wonky. 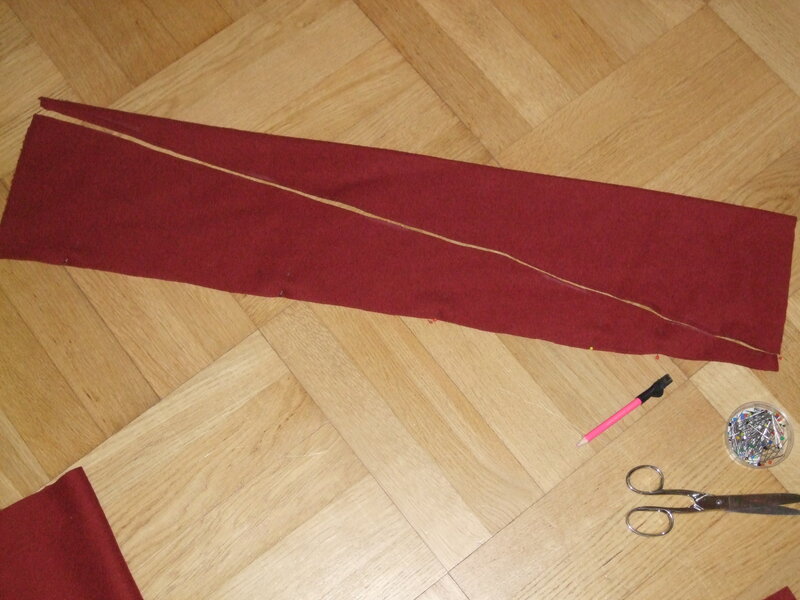 The lowest hem is folded double, which was unnecessary with this thick fabric, so I will pick it up and (hopefully) make it better before I’ll consider myself completely done with the sewing. 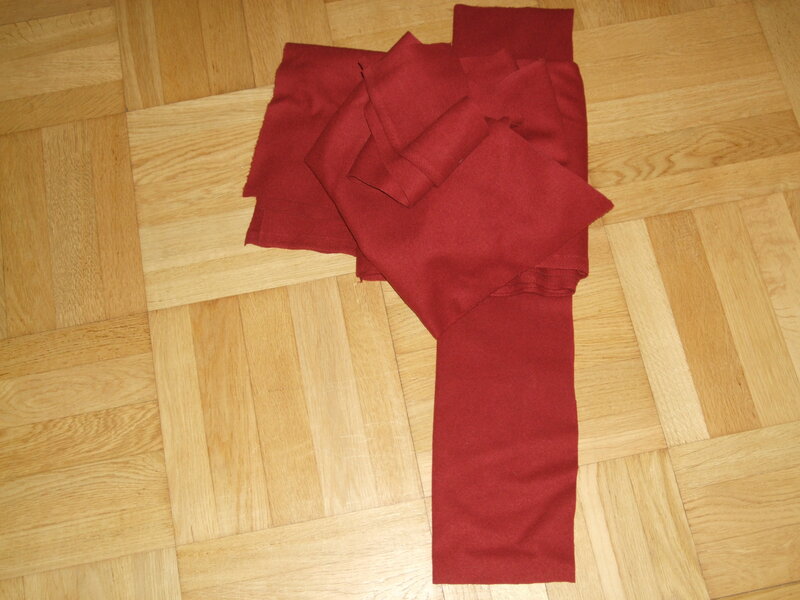 Fabric: Dark madder red wool. In stash for 7 years, which makes me feel a bit better about the 2 months delay of the blog post! Pattern: Rectangles, rectangles made into triangles, and squares. Anyways, back to the stash. This is my stash. I was extremely proud of my not-so-large stash, until I remembered that there are some boxes in the basement too…. This is once again a rectangles-triangles-squares project, but this time it’s all hand-sewn and I’ve gotten a new favourite stitch, which you will get to see in the more official post of the project. 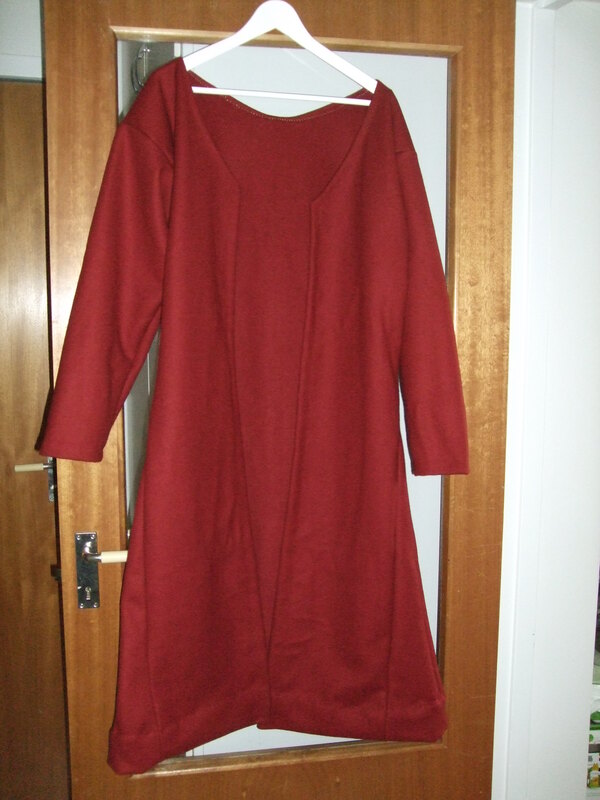 I need to finish one side and then onto the hemming, then it’s done until the Accessorize challenge. What is it, you may ask? 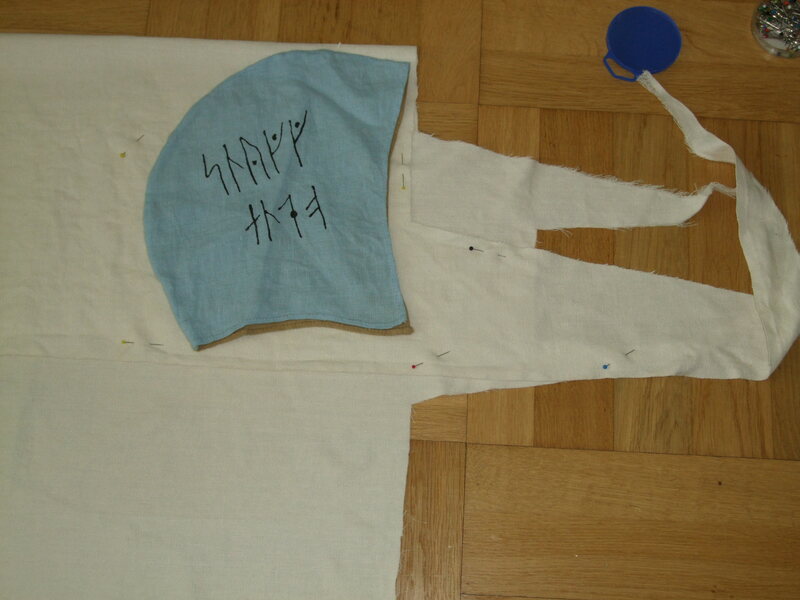 Well, it’s for a Viking outfit, a much popular but not un-disputed kaftan for women. The disputes are really interesting too and I’ll write a larger post of it in the near future, since I think it’s a really interesting but in fairness also a rather tiresome debate, so I don’t have time to do it justice right now. I have come a longer way than shown on the photo above, but I seem to have misplaced my camera somewhere so I don’t have the other progress photos on my computer yet. So until next time, scatterbrain over and out.